House Bill 29, which would needlessly impede implementation of universal curbside recycling in Delaware, comes up before the House Natural Resources Committee Wednesday afternoon. The bill would require waste collectors to present their customers with separate cost breakdowns for regular waste and recycling pickups. This is a matter that was decided last year by SB 234, which institutes statewide curbside recycling in Delaware, and requires that any waste hauler provide recycling as an integral part of waste collection. Opponents of statewide recycling tried and failed to pass an identical amendment to SB 234 that would have mandated a separate cost breakdown. House Amendment 1 to SB 234 was defeated with 15 yes votes and 23 no votes. An unsuccessful lawsuit filed in Chancery Court to block the implementation of SB 234 also raised the issue. HB 29 would impose unnecessary and unwarranted administrative burdens on firms and local governments that collect waste and recyclable material from Delaware’s homes and businesses. Waste collectors would have to have their accountants perform complex cost analysis for no good purpose. For instance, the bill doesn't specify whether costs be allocated by the customer, by the trip or by the ton. I've performed cost accounting in a variety of circumstances, and know from experience that how the analysis is structured profoundly affects the result. No public purpose would be served by this exercise, except to give recycling opponents another chance to claim that recycling is too expensive. The opponents of recycling continue to ignore the economic advantages of single stream recycling. Waste collectors will use the same trucks and crews for regular waste and recyclable materials. The only difference is that the trucks will deliver one load to a recycling facility on one day and the other to a landfill on another. These opponents also forget that SB 234 will create long term environmental benefits and capital savings for Delaware through the extension of the useful life of our existing landfills. As I see it, HB 29 is a nuisance bill that would serve no useful purpose other than to create a impediment for those working faithfully to implement the law. Given that the matter has been decided by the General Assembly and Chancery Court, this bill does not deserve more than a cursory consideration from the committee. "Many scientists note that Alaska's climate is changing," Gov. Palin announced at the time. "We are already seeing the effects. Coastal erosion, thawing permafrost, retreating sea ice and record forest fires affect our communities and our infrastructure. Some scientists tell us to expect more changes in the future. We must begin to prepare for those changes now." In the intervening years, Gingrich has oscillated between assailing efforts to combat climate change and urging that we act to protect the climate. As recently as 2008, he appeared with Nancy Pelosi, saying, "we do agree our country must take action to address climate change." Officially, the bureau's decision was a "determination of no competitive interest," which helps Bluewater avoid further delays in its effort to gain a lease and permit to start construction. That's because it won't have to grapple with another developer for the rights to build on the ocean tracts it has chosen. While this may seem arcane, it is an important step forward, not just for Bluewater, but for the entire industry. Two years ago, the federal government had no process for even considering a request to build offshore wind. There is nothing so difficult for a bureaucracy to manage as novelty. In this instance, the Interior Department had to create a new agency. BOEMRE has expedited the process to weed out bids from firms that can't demonstrate the ability to develop a project. Do not be deceived. The opposition to the scientific evidence supporting anthropomorphic global warming ("AGW") among some conservatives may, at times, hide behind a pseudo-scientific veneer. However, much of it is often really rooted in an anti-intellectual strain of religious fundamentalism. It is this element—a barren theology that leaves no room for our God-given gifts of reason and discovery—that gives the opposition its implacable character. Some say faith and reason are at war in the modern age. Not so for men like Rep. John Shimkus, who premises his rejection of AGW on Scriptural passages promising that the Earth will not perish in a flood. For him, the war is over, and reason has been routed from the field. And sadly, Rep. Shimkus is not alone. Many conservative opponents of AGW claim that it is impossible because God would never permit it, or that it is erroneous because only God, and not humanity, has the capacity to destroy the world. I suppose these individuals have never heard of nuclear weapons. It is the religious aspect of the AGW debate that has taken it out of the realm of mere policy, and planted it firmly in the thick of the culture wars. As a result, any understanding of opposition to AGW, or of the apparent anti-intellectualism in segments of the GOP today, must begin with a discussion of religion and theology—specifically, the anti-intellectual theology underpinning elements of the fundamentalist Christian Right. In this regard, climate denial is merely one aspect of a broader rejection of reason and scientific inquiry. With respect to the environment, these theological strains tend to place great emphasis on humanity's "dominion" over the Earth, but downplay or entirely ignore our concomitant responsibility for the stewardship of it. In so doing, they provide a false reading of the Book of Genesis, one that ignores the connotations of nurturing and care present in the original Hebrew text in favor of an interpretation emphasizing naked power and supremacy. Simply put, the Biblical mandate is to care for creation, not to commodify and exploit it. In addition, AGW also touches on millennialist currents and visions prevalent in some streams of fundamentalist Christianity. This is significant. Stewardship is rooted in a concern for the future well-being of others. It matters little if you believe our world has no future, or that God will miraculously deliver you from it, and its consequences. Like the Easter Islanders of old, many among us seem ready to bet that the moai will come to life and rescue us from ourselves. In the face of very real problems, such an escape into magical thinking may temporarily relieve anxiety, but it actually accelerates the trajectory towards disaster. In its opposition to AGW, the anti-intellectual theological strain also ignores the first of the cardinal virtues- prudence. Prudence speaks to the need for sagacity, for careful reflection and consideration. It is a requisite for effective stewardship, and effective political leadership. Today, there is no debate in the scientific community about whether the Earth is warming—it is. There is also a nearly unanimous consensus that human activity is responsible for this warming. There is some debate over the severity of the consequences that will inure from this and, on the margins, over whether we can take any remedial measures that will slow, stop, or reverse this process. The consensus position, however, is clear—it will probably have a significant negative impact on human civilization and the natural world, and there are practical steps that could be taken now to avoid this fate. Given the potential implications for humanity, it is reckless to ignore the broad scientific consensus on AGW. Doing so in the face of this evidence is tantamount to an abdication of both our duty to future generations, and of our duty to care for the natural world. It is an act of immense selfishness. After all, the natural world, our Earth, is a shared, a common, inheritance. As the late Admiral Hyman Rickover once said: "A prudent and responsible parent will use his capital sparingly in order to pass on to his children as much as possible of his inheritance. A selfish and irresponsible parent will squander it in riotous living and care not one whit how his offspring will fare." Placing religion and theology in the service of such selfishness and irresponsibility is an act of deep betrayal. In the end, a theology that requires the rejection of empirical evidence on a variety of topics, and an escapist descent into magical thinking, is not a living faith. It is a dead one. Such a faith is not spiritual armor for the believer going out into the world, but rather, an intellectual tomb for someone hiding from it. Let me suggest something different. Faith and reason are not at war–or at least, do not need to be. Religious belief and rational inquiry, faith and doubt, are not binary pairs of opposites. Indeed, at a fundamental level, both religion and science remind us of the deep mystery underpinning the world, and our existence in it. Scientific inquiry also expands our knowledge of the natural world and the universe which, we are told in Genesis, is a reflection of God. This is why learning, the quest for knowledge and understanding, is a sacred thing. Or as Pope Benedict XVI has taught, religious faith "consolidates, integrates and illuminates truth[s] acquired by human reason." For my own part, I think God gave us our minds, our intellects, and our capacity to reason, in the hope that we would put them to use advancing the common good. Today, in their opposition to AGW, some religious conservatives imagine themselves as brave dissenters defending individual rights and Biblical truth from yet another assault by a grasping, rapacious, regulatory Government and the atheist liberals that run it. They are wrong. They are actually reprising the role of the Inquisition in the trial of Galileo. And in so doing, they have forgotten something fundamental about faith. If God is the author of the world, then the truth, whatever it is, can never be a heresy...and people of faith ought never fear it. Early warnings about potential nuclear dangers in Japan and about Wall Street’s propensity for risk-taking without liability were both dismissed as paranoid anticipation of low-probability events. With both disasters, regulatory failures set the stage, and taxpayers will end up paying most of the social costs. Effective risk management is central to economic efficiency. Yet major players in both crises have insisted that they should not be held accountable for risks they underestimated. A common fallacy is thinking of the contributing causes of a disaster as unrelated when they are often related. The investment bankers and traders thought the simultaneous collapse of their various investments and derivatives couldn't happen, but in a market meltdown, they all became highly correlated and crashed in unison. Likewise the Japanese engineers imagined that the simultaneous breakdowns of diesel backup generators, cooling valves and pumps was highly unlikely, but the cascading failures were all caused by one event. In each case, the engineers and managers never understood how so many components could fail at once. This fallacy can lead to a tragic underestimation of risk. Take three components of a complex system. If the chance of failure for any one component is 1 percent, then the odds that all three could fail at the same time would be one in a million—if the three events are unrelated. But if breakdown of one component contributes to, or is correlated to, the failure of another, the chance that all three could fail would be closer to one in a hundred, rather than one in a million. Four years ago, there were fears of a financial meltdown — a term borrowed from the nuclear power industry. Now there are fears of a real meltdown. Comparing the two events may risk seeming insensitive to the rising human toll in northern Japan, but there are similarities in causation. In each case, overconfidence born of experience led to increased risks once a disaster unfolded. These errors in risk management are compounded and repeated when the engineers and managers allow themselves to believe that they were overcome by extremely unlikely events. And thus, we hear over and over again that yet another disaster was caused by yet another perfect storm. Even in the face of a disaster of unimaginable scale, the cynics still consider the proponents of renewable energy to be impractical. But I don't see why I or anyone should apologize for advocating developing energy resources that don't blow up and poison the air, land and water for miles around. Such large scale disasters are expensive as well as dangerous, which is a key reason why no new nuclear plants have been built in the U.S. for a generation. Several years ago, I heard Jeff Immelt, the CEO of GE, say that commercial nuclear power won't be developed in the U.S. without federal liability or financing guarantees. The risks, however remote, are so expensive that investors don't want to take them on, no matter what the ROI. Even so, some supposedly hard-headed folks consider nuclear power to be more practical than wind or solar. I know that some advocates for tackling climate change are convinced that nuclear power has to be part of the solution. But if the risks are so scary that industry can't finance a power plant without offloading financial liability onto the federal government, it may not be a practical part of the solution. hereby declare our interdependence and resolve to work together in harmony with our environment to enhance the quality of life everywhere. "Over time if you put so many disincentives against any U.S. manufacturing or production company, or oil and gas exploration company, they'll go out of business," Barton said. Barton, perhaps the oil and gas industry's staunchest support on Capitol Hill, says the subsidies for the industry should remain unchanged "so long as you believe that you believe in the free market capitalist system and they should be headquartered in the United States." While Barton's comment is outrageous (and irony free when it comes to the question of free enterprise), so is the fact that these subsidies are still in place. Consider Barton's choice of words: cutting subsidies would create "disincentives" for oil and gas companies. 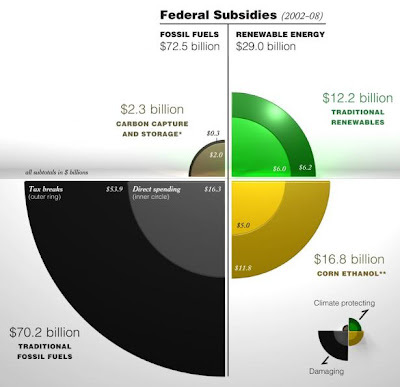 President Obama has proposed cutting these subsidies by $46 billion over the next ten years. Even in the face of these facts, critics complain about subsidies for renewable energy, saying that wind turbines and solar panels should compete on their own. But there is a rationale for these breaks: these are new industries with developing technologies, significant public benefits and large potential for future growth. On the other hand, the oil and gas business is mature (having been around for more than a century) with standardized technologies, significant public costs and little potential for future growth. But Tarabicos maintains DelDOT's decision contradicts the agencys history of granting waivers for traffic impact studies to other developers along U.S. 40 and Del. 7. "DelDOT hasn't seen a request for a traffic waiver in the Route 40 corridor that they didn't like -- until this one," Tarabicos said. This provides a good example of the principle of cumulative impact in regulation. If there are already two large shopping centers at the intersection, why not a third? The developer in this case can complain that this project should have been treated exactly like the previous projects, but the real world impact would be to push traffic to the breaking point. Of course, this project had been helped along by seeking special treatment, such as the absurd request to treat building a large retail facility on a parking lot as redevelopment under County code, and slipping approval through County Council as part of a consent agenda. The project would have added more than 500 vehicles to the road during rush hour. The first or second 500 vehicles through the intersection may not have led to gridlock, but an additional 500 could. The cumulative impact of another 500 vehicles requires that regulators treat the project differently than they might have a similar proposal twenty years ago. Public roads are not infinite resources. To demand that each project be given the same approval regardless of the cumulative impact is to ignore the truth that public resources are limited. "This is realistically the next step. As prices continue to drop, we don't need such a big rebate," said Dale Davis, president of CMI Solar Electric and president of the Delaware Solar Energy Coalition, an industry group. He also sits on the Renewable Energy Task Force that designed the program. The task force, which was charged by the General Assembly with designing a sustainable solar industry in the state, also includes utilities, environmental groups, the solar manufacturer Motech, and representatives of various state agencies. I am a member of the task force as well, and can testify first hand to the work being done to get the biggest bang for the buck. Task force meetings are open to the public; the next meeting is Wednesday, March 9 at 9:30 a.m. at the Public Service Commission hearing room in Dover. I can think of two ways in which support for solar power is helping to drive prices down. First, unit costs are coming down as manufacturers ramp up production. Second, the growing market for solar panels is driving further innovation, making panels more efficient or less expensive to produce. 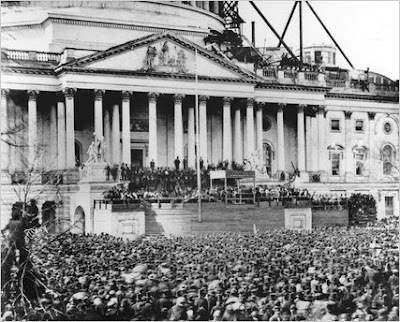 Abraham Lincoln was sworn in as president 150 years ago today. His first Inaugural Address still stands as one of the defining expositions on the principles of self government. The New York Times has posted the text and a facsimile of his notes, with handwritten edits in the margins and pasted onto a typeset draft. The notes include the famous ending, prompted by suggestions by William Seward, written at the bottom of the page. In the speech Lincoln presents a clear, and now definitive, case that the United States cannot be dissolved by individual states. The argument for states' rights may be raised from time to time, but the question of the constitutional integrity of the United States has been settled by Lincoln's speeches and the outcome and aftermath of the Civil War. One section of our country believes slavery is right and ought to be extended, while the other believes it is wrong and ought not to be extended. This is the only substantial dispute. The fugitive-slave clause of the Constitution and the law for the suppression of the foreign slave trade are each as well enforced, perhaps, as any law can ever be in a community where the moral sense of the people imperfectly supports the law itself. The great body of the people abide by the dry legal obligation in both cases, and a few break over in each. This, I think, can not be perfectly cured, and it would be worse in both cases after the separation of the sections than before. The foreign slave trade, now imperfectly suppressed, would be ultimately revived without restriction in one section, while fugitive slaves, now only partially surrendered, would not be surrendered at all by the other. The Chief Magistrate derives all his authority from the people, and they have referred none upon him to fix terms for the separation of the States. The people themselves can do this if also they choose, but the Executive as such has nothing to do with it. His duty is to administer the present Government as it came to his hands and to transmit it unimpaired by him to his successor. Why should there not be a patient confidence in the ultimate justice of the people? Is there any better or equal hope in the world? In our present differences, is either party without faith of being in the right? If the Almighty Ruler of Nations, with His eternal truth and justice, be on your side of the North, or on yours of the South, that truth and that justice will surely prevail by the judgment of this great tribunal of the American people. A group of researchers from Harvard have published a full life cycle accounting of the cost of coal power in the United States, and the results could be meaningful for Delaware. The externalities include land disturbance, public health costs in Appalachia, air emissions, and climate costs. If the costs were factored into energy prices, electricity from coal power would be an additional 17.84 cents/kWh. The Harvard study’s authors calculate the national cost of air emissions (one component of the costs) to be $187.5 billion annually, which would add 9.31 cents/kWh rates if it were included in electric bills. The average residential price in Delaware in 2008, according to the Energy Information Administration, was 13.93 cents/kWh. The effects vary greatly by locality, so there is no way to neatly break down the costs for Delaware. The most directly relevant effect for Delaware would be the costs of air emissions from burning coal. Delmarva Power’s draft Integrated Resource Plan (IRP) includes a calculation of the benefits (in avoided health costs) of $1.8 billion to $4.3 billion over ten years from reducing coal power and increasing renewable energy. But comparing these numbers is not a straightforward exercise; the Harvard study calculates total externalities, while the IRP number is avoided externalities. Even so the Harvard study could provide a useful benchmark for Delaware. Stay tuned. One dollar invested in solar cells produces about 275 watts a year of electricity. Compare this to annual production per dollar invested for the following; offshore wind produces 390 watts/$, onshore wind 775 watts/$, and nuclear power 3000 watts/$ invested. Sadly, no source is offered for these numbers, which would have been helpful in clarifying the meaning of the numbers. The cost of power plants is typically expressed as either dollars needed to build a kilowatt of capacity or cents per kWh of output. But Stevenson isn't clear as to whether he is talking about capacity or output, which makes his numbers almost impossible to interpret. I have not seen any figures that support Stevenson’s assertion that nuclear power is ten times more cost effective than solar power. The cost of solar power has been coming down (a point Stevenson helpfully illustrates in a graph), while the cost of a new nuke plant continues to be prohibitive, and the industry insists that no new nuclear power will come online without financial guarantees from the federal government.